With 9 grams of fiber and 39 grams of protein, these Mojo Turkery Tacos will keep you satisfied with every crunchy bite. Two tacos have 430 calories, and you'll be getting your fill of nutrients from tomatoes, black beans, salsa and avocado. Avocados are packed with potassium and add a creamy flavor to these lean tacos. Turkey meat is also a great alternative to beef. It has about 50 calories and 2.5 grams of fat per serving, while beef has 280 calories and 22 grams of fat per serving. 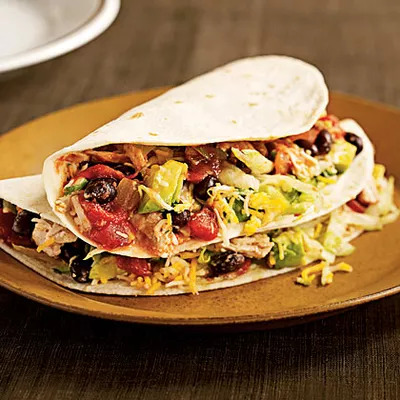 Ingredients: fresh lemon juice, fresh orange juice, ground cumin, hot chili powder, minced garlic, chopped fresh cilantro, fat-free sour cream, coarsely chopped turkey breast, flour tortillas, black beans, salsa, iceberg lettuce, reduced-fat 4-cheese Mexican blend cheese, avocado.